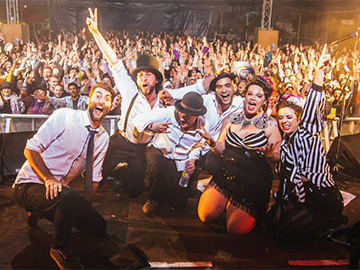 The Electric Swing Circus are a six piece electro swing band based in Birmingham. We had hoped they would debut in 2017 but this couldn’t go ahead as they we’re stuck in Germany after a performance the previous night. So their much awaited Wickham Festival debut will be on Saturday 4th August 2018. This band is well respected for their live performances. If you can do the Charleston you’ll be in heaven. They perform a modern take on some vintage genres … we’re very excited to welcome these talented musicians to our stage! The Electric Swing Circus first formed in June 2011. The band’s preview EP, Penniless Optimist, was released in September 2011, and their debut album “Electric Swing Circus” in May 2013. Earlier this year they released their second album. Click here to listen to or buy “It Flew By”. The Electric Swing Circus are also the team behind The Swingamajig Festival in Birmingham, which they headline each year. It is regarded as one of the main Vintage Remix / Electro Swing events in the world … so be sure to check it out for something very different. The Electric Swing Circus’s sound is a powerful combination of vintage samples, electro beats, gypsy-jazz guitar, electric double bass, keys, live drums and dirty synths. Fronted by an engaging female double-act, who perform an extensive variety of vocal styles, the Electric Swing Circus delivers a consistently dazzling show. Electric Swing Circus added a cover video. Tickets are selling fast so get them now !